The development of novel oral anticoagulants that are effective alternatives to warfarin in non-valvular atrial fibrillation (AF) is a welcome advance. However, a variety of unresolved problems with their use, and not least with their cost, make it important to re-evaluate the use of warfarin as it will likely remain the anticoagulant of choice in South African patients with non-valvular AF for the foreseeable future. In this article, we review the correct clinical use of warfarin. Guidance is provided on commencing warfarin treatment, maintenance dosing, the recommended steps when temporary withdrawal of treatment is necessary, the management of bleeding, and the use of warfarin in chronic kidney disease. Techniques for changing from warfarin to one of the new oral anticoagulants and vice versa are included. Although the benefits of the novel oral anticoagulants (dabigatran, rivaroxaban, and apixaban) may surpass warfarin in non-valvular atrial fibrillation (AF), their high cost makes them unaffordable to most South Africans. Therefore, it remains imperative that optimal management of warfarin anticoagulation is provided to these patients. Anticoagulation for non-valvular AF balances the risk of thrombo-embolism against the risk of haemorrhage. 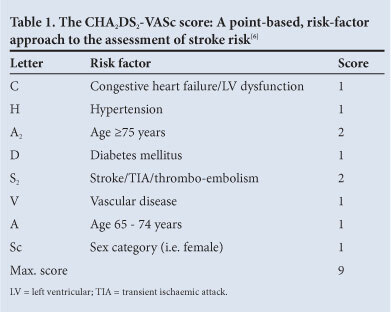 The CHA2DS2-VASc score most accurately predicts the risk of thrombo-embolism and stroke (Table 1). Anticoagulation is recommended for a CHA2DS2-VASc score of >1; essentially this includes all non-valvular AF patients with the exception of those <65 years of age with lone AF. 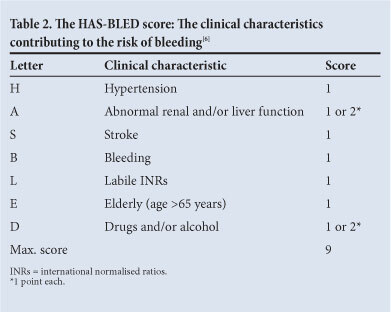 The risk of bleeding is predicted from the HAS-BLED score (Table 2) which should not be used to deny anticoagulation to anyone, other than those at low risk of thrombo-embolism. A baseline prothrombin time should be obtained in all patients. A personal or family history of bleeding merits investigation before starting treatment. Warfarin therapy should be commenced without a loading dose, usually at 5 mg daily. A lower starting dose is appropriate in the aged, the frail or malnourished, and those with a low body weight, congestive heart failure or impaired kidney function or with concomitant medication increasing warfarin sensitivity. The starting dose may be estimated using an algorithm based upon the clinical and demographic patient characteristics including genetic information if available (http://www.warfarindosing.org/Source/Home.aspx). It takes several days to fully establish warfarin's anticoagulant effect. When anticoagulation is required immediately, full anticoagulant doses of unfractionated heparin (UH) or low molecular weight heparin (LMWH) should be given concomitantly until 4 days after a therapeutic INR is reached. Two consecutive INR values should be in the therapeutic range during the overlap. Once the therapeutic range (INR 2 - 3) is reached, INR testing should be repeated at least twice at 2 - 4-day intervals to ensure the stability of anticoagulation. Arbitrary warfarin dose adjustment frequently overcorrects the INR. Not adjusting the dose when the INR is in range and only making small (10 - 15%) adjustments for the vast majority of those out of range improves the time in therapeutic range and clinical outcomes. 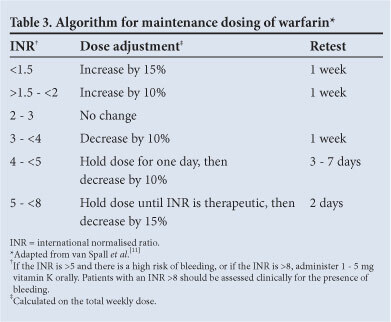 Changes in dose are best guided by an algorithm promoting minor changes in the total weekly warfarin dose and reassessing the effect of the change within a week (Table 3). Minor bleeding is a common occurrence in anticoagulated patients and should not readily lead to dose adjustment or discontinuation of therapy. When the INR deviates above 5 in patients who are not bleeding, 1 - 2 doses of warfarin should be withheld and the maintenance dose adjusted downwards. Should the INR rise above 8, 1 - 5 mg of vitamin K should be given orally and the INR checked 24 h later to assess whether further vitamin K is needed. INR testing should occur at least monthly after a stable warfarin dose is achieved. Self-monitoring and self-management of oral anticoagulation is safe for suitable patients of all ages and reduces thrombo-embolic events by almost 50%. In South Africa, the cost of home monitoring is similar to the cost of INR testing and dosing by pathology laboratories. 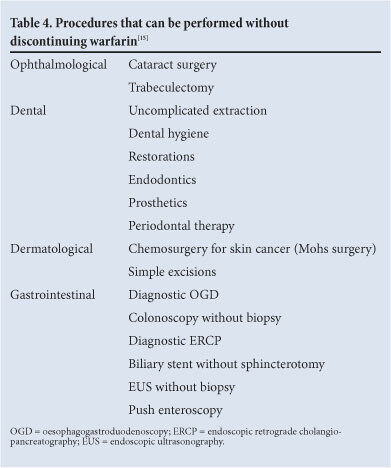 Bridging is required for major surgery, which means the timeous preoperative withdrawal of warfarin while introducing UH or LMWH prior to surgery, and the postoperative reintroduction of anticoagulation. Based upon the prevailing INR, warfarin should be withdrawn in sufficient time to allow the INR to fall. The patient's usual warfarin dose should be taken into account; the lower the usual dose, the longer it may take. Of patients whose INR is in the therapeutic range, 93% will typically have an INR of <1.5 five days after stopping warfarin. The hiatus in anticoagulation may be bridged with either UH or LMWH. Out-of-hospital self-administration of 1 mg/kg enoxaparin 12-hourly subcutaneously is more cost-effective (instruction on injection technique should be provided). LMWH is usually introduced 36 h after stopping warfarin. The dose of enoxaparin should be reduced by 25% in the elderly and those weighing <60 kg. In severe kidney dysfunction the dose frequency should be reduced to 1 mg/kg daily to compensate for diminished renal excretion. Dose adjustment according to anti-factor Xa (anti-FXa) activity measured 2 - 3 h after administration is suggested in patients receiving decreased doses, those with decreased renal function and obese patients (who may need larger doses). An anti-FXa therapeutic target value of 0.5 - 1 IU/ml is suggested although it has not been validated. UH or LMWH should be withdrawn during the last 24 h before surgery. In patients at high risk of intraoperative bleeding it is safe to operate when the INR is <1.5. The decision to bridge balances thrombo-embolic risk against the risk of peri-operative haemorrhage. The input and concurrence of the surgeon is invaluable. Although the incidence of thrombo-embolism may be similar with bridging or no bridging, bridging may be associated with a higher risk of bleeding. However, generalisation is difficult because the timing of warfarin withdrawal, the type, dose and timing of heparin used to replace warfarin, and the reintroduction of anticoagulation postoperatively varied significantly among studies. Patients at high and moderate thrombo-embolic risk (CHA2DS2-VASc score >4) should receive the shorter-acting anticoagulant in full dose, whereas in those at lower risk a low-dose regimen or no bridging may be sufficient. Anticoagulation is reintroduced as soon as feasible after surgery, using either UH or LMWH in combination with warfarin. The UH/LMWH dose used depends upon the residual bleeding risk as determined by the surgeon. It is prudent to begin with lower doses and up-titrate daily according to the observed response. 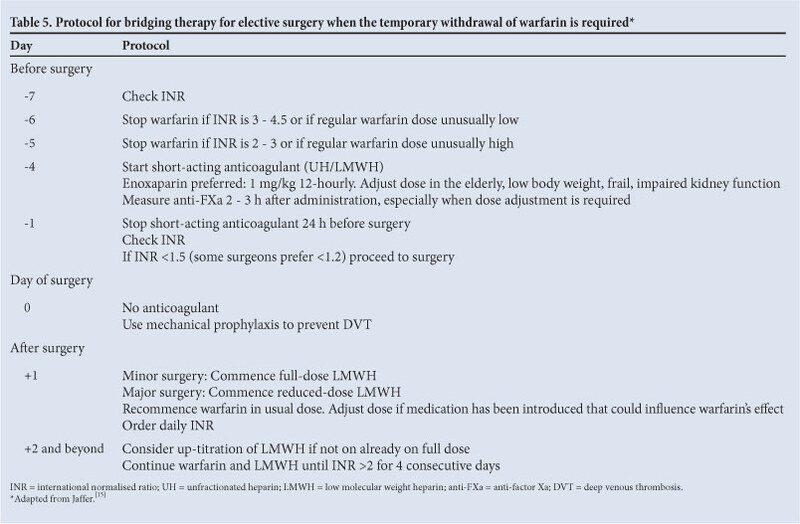 Warfarin is usually recommenced at the dose used preoperatively but may require adjustment if medications interacting with warfarin have been introduced peri-operatively. The INR should be measured daily during this phase. UH/LMWH should be continued until 4 days after a therapeutic INR is reached. Two consecutive INR values should be in the therapeutic range during the overlap. Table 5 outlines a protocol used for bridging therapy. Although there are no specific antidotes for warfarin, rapid and effective reversal of its effect is possible, in contrast to the novel oral anticoagulants for which specific reversing agents are presently lacking. When urgent surgical intervention is indicated, the INR should be measured immediately. As vitamin K is slow-acting, it will most frequently be necessary to administer both prothrombin complex concentrate (PCC) and vitamin K intravenously to correct the INR to an acceptable level in patients requiring surgery within 12 h. If surgery can be delayed for >12 h, vitamin K alone may suffice. In either case the INR should be monitored frequently as it may rise again once the effects of the reversing agents dissipate. There are significant risks of drug-drug, drug-food and drug-herb interactions with warfarin. Courses of antibiotics or non-steroidal anti-inflammatories most frequently perturb warfarin's effect. Although a large number of interactions have been described, most report on potentiation of warfarin's effect in a single case. The INR should be monitored frequently when any new drug is introduced in a patient taking warfarin. Anticoagulant-associated bleeding is serious. In patients admitted for vitamin K antagonist-associated bleeding, the in-hospital mortality rate was 7.6% and 90-day mortality was 14%; 15% of survivors were dependent on help with activities of daily living thereafter. The INR should be checked immediately whenever bleeding occurs. If the INR is within the therapeutic range, warfarin should be continued and the source of bleeding treated on its own merits. Significant bleeding should be treated with 1 - 3 mg vitamin K given by an intravenous or oral route. In major bleeding, warfarin can be reversed rapidly by 25 - 50 U/kg four-factor PCC and 5 mg vitamin K given intravenously. Fresh frozen plasma produces suboptimal reversal and should be used only when PCC is unavailable. Recombinant factor VIIa is not recommended for emergency reversal. When changing to one of the novel oral anticoagulants, warfarin should be withdrawn and the INR monitored daily. The novel oral anticoagulant may be commenced once the INR has fallen below 2. However, a survey of dabigatran reported increased rates of both thrombo-embolism and bleeding among previous warfarin users during the early months of the transition. As highlighted by the experience with rivaroxaban, the withdrawal of the novel oral anticoagulants may lead to inadequate anticoagulation and thrombo-embolism. As all the novel oral anticoagulants have a short duration of action, warfarin should be commenced on the day after withdrawal in combination with bridging therapy if the risk of thrombo-embolism is high. The INR should be monitored frequently until the therapeutic range is achieved.